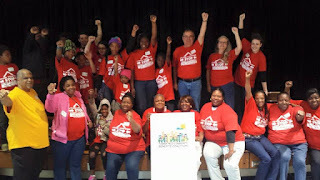 Tenants Organize in Peoplestown, Summerhill, Mechanicsville! 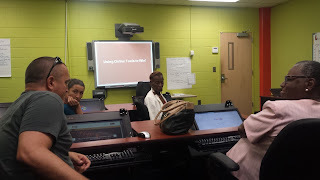 This week tenant leaders from multiple apartment complexes came together to learn how to organize tenant associations across the Peoplestown, Mechanicsville, and Summerhill communities. We were excited to the room absolutely packed with residents ready to organize against what some see as the coming displacement that often comes with big development or low income communities and build strong tenant associations that have the power to improve their living conditions. It's not only exciting that tenant associations are emerging in these communities, they're emerging together as a rising tide. The room was absolutely packed and clear next steps were made for each complex represented. 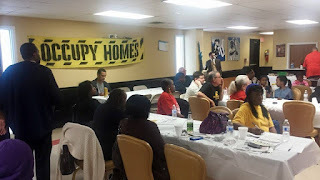 AFSC has partnered with Occupy Our Homes Atlanta over the last two years to a listening project designed to launch organizing work that's informed and led by residents. 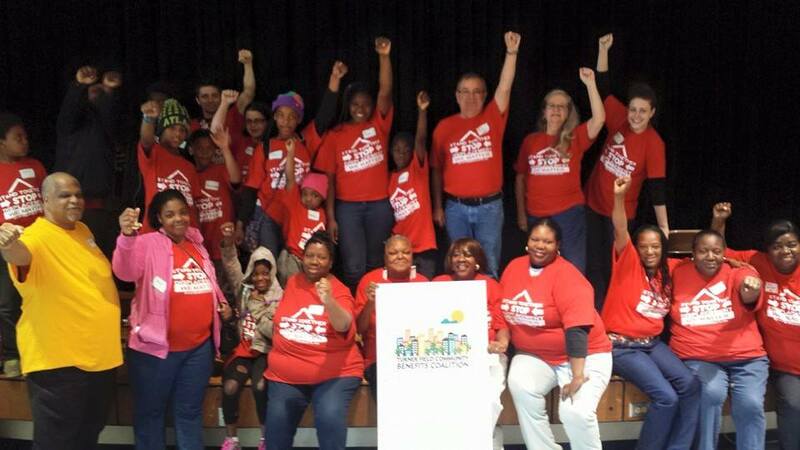 The tenant organizing project is one of the results. By the end of the year we hope to see seven new tenant associations in the three neighborhoods, two have already formed! Issues raised by tenants included black mold, deplorable conditions, poor treatment by property management, retaliation for individual attempts to organize from property managers, and displacement of long term residents. 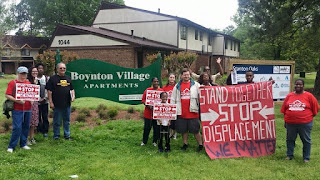 Despite that fact that there is still a degree of fear of retaliation from property management, it was exciting to hear that when residents act as a collective , as was the case recently with Boynton Village, they win! 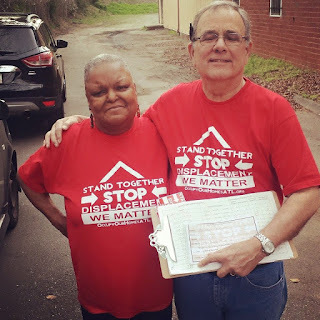 AFSC is exciting to continue to support this important work as the eye of development becomes more and more fixated on the Turner Field neighborhoods. Several weeks ago we asked you to sign the petition to stop WRI from evicting Vaniyah and her eight beautiful children and you signed! We asked your to call the private equity group and demand they give the family time to relocate on their terms and you did! When Vaniyah reached out she was so upset with WRI that she had no interest in working out a deal that kept her family in the house, she just needed a fair amount of time to find acquit safe housing for her and the family. We quickly organized a press conference, launched an online petition, organized a call in day, and delivered the petition directly to WRI's Atlanta office. 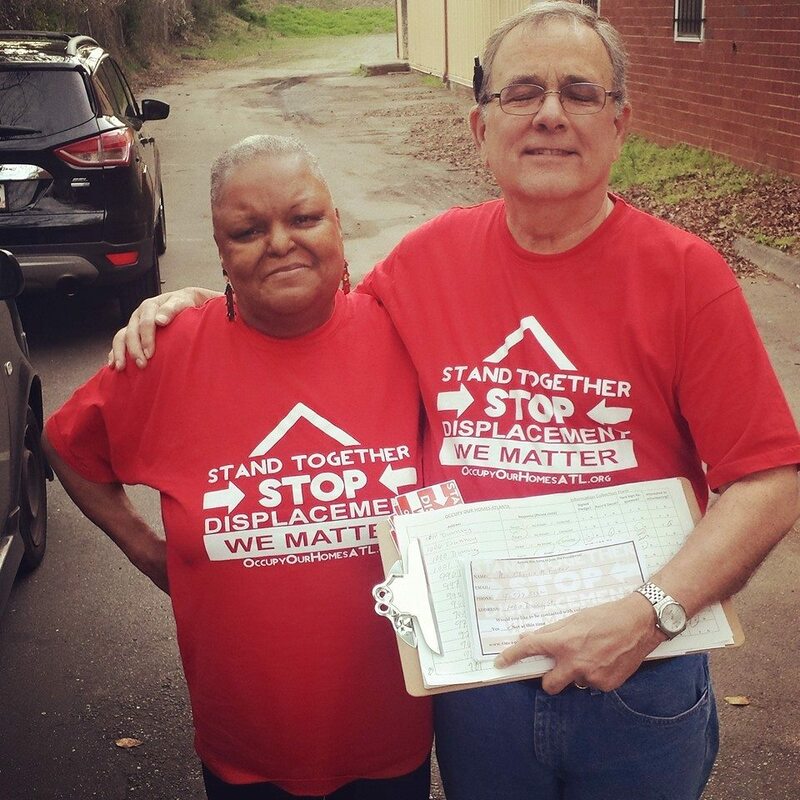 Because of your calls and your signatures, which we hand delivered to WRI's Atlanta office, Vaniyah has been given 60 days to find a new home and the housing authority has agreed to make finding a home a priority. This simply would not have been possible without EVERY one of ya'll! Thank you all for your signatures, for sharing, for calling! 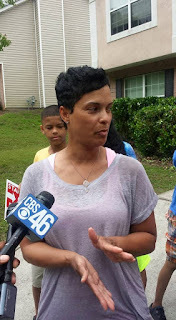 Together we stopped an amazing family from being put on the street! Please consider making this important work possible by investing what you can into it. We operate on a shoe string so every dollar counts! American Friends Service Committee has been excited to be a part of the Turner Field Benefits Coalition. 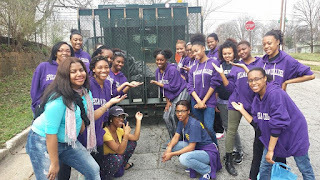 Our belief that communities should be controlled by those that live in them has informed and guided our participation in the communities around Turner Field over the last four years. Last night we were excited to team up with Rise-Up Georgia to facilitate a social media training that focused on how to use social media to build public pressure and win campaigns. Building a movement takes time and lots of training when you're in it to win it. We're super excited to have partners like Rise-Up Georgia stepping up to make dynamic trainings like this happen. We look forward to supporting more trainings for residents in the coalition over the summer. In the spirit of the training we encourage all of you to like the Turner Field Benefits Coalition on facebook and Twitter! So I wanted to update folks on all the exciting work going down in and around the Peoplestown community. Some of you might be aware that last year we partnered with residents and community organizations to facilitate a listening project in Peoplestown. 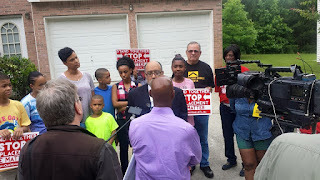 After looking at the results it was clear that Peoplestown residents cared deeply for their community and have deep concerns about it's futures. 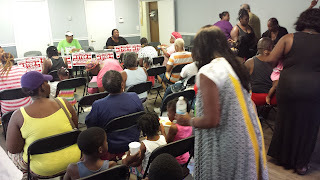 On the top of the list of concerns was the lack of affordable house, access to good food, and trash in the community. Since the listening project I'm excited to report that we have worked with Peoplestown residents to develop and anti-displacement campaign and a series of housing justice training's. One of the exciting developments has been a strong effort to organize tenant associations in the communities surrounding Turner Field. 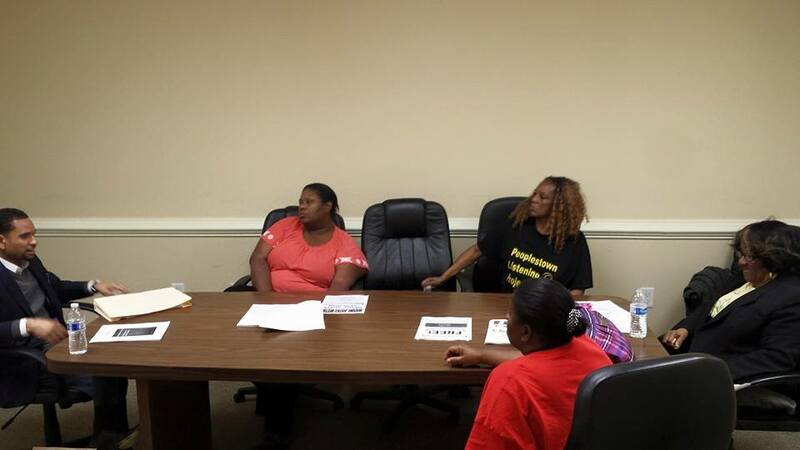 We also launched a weekly free tenants rights legal clinic with Attorney Joshua Davis. It's already been announced that the Braves will be leaving Turner Field in 2017 and all that land will be up for grabs for developers. 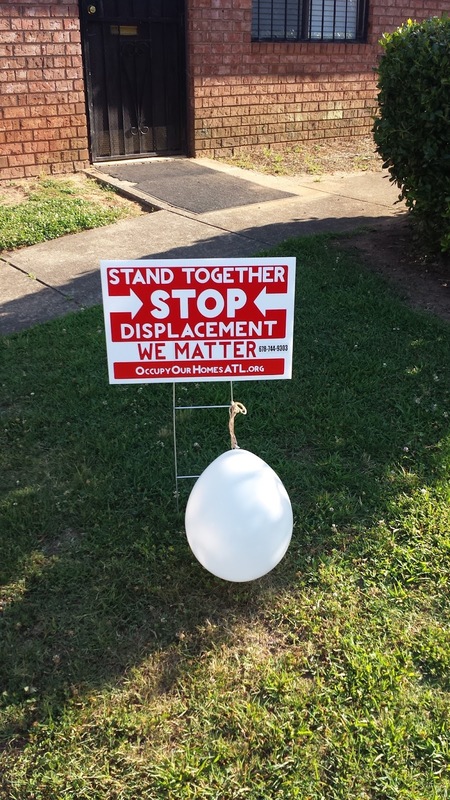 Fighting mass displacement means pushing for a process that includes long term residents and ultimately benefits the surrounding neighborhoods. If history teaches us anything it's that development comes with lots of promises to the community but usually ends up hurting and displacing long term residents. In order the fight for a process and result that lifts up those that have been holding down the community long before it was cool or profitable to buy property here residents have realized now is the time to organize people around a platform insure residents aren't displaced, real jobs are created, and that those that live here have a say in what happens to the land. 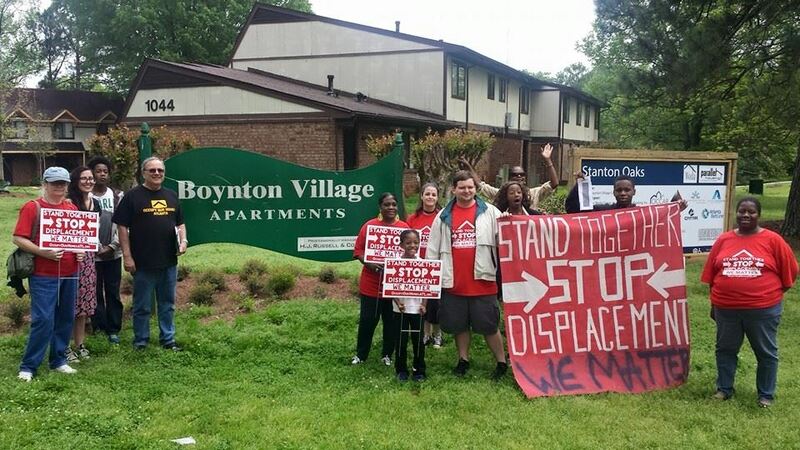 One exciting development is that in the effort to organize a tenants association at Boynton Village tenants have won a huge victory. The owners of Boynton Village, the Woda group, have agreed to sign a new agreement with HUD to keep the complex affordable for the next 20 years. This is a big win considering other apartment complexes will consider converting to market rate as the price of rent in this area continues to increase with each passing month. This may not have happened if residents hadn't organized together, holding meetings, launching petitions, and demanding face to face negotiation with the Woda group. 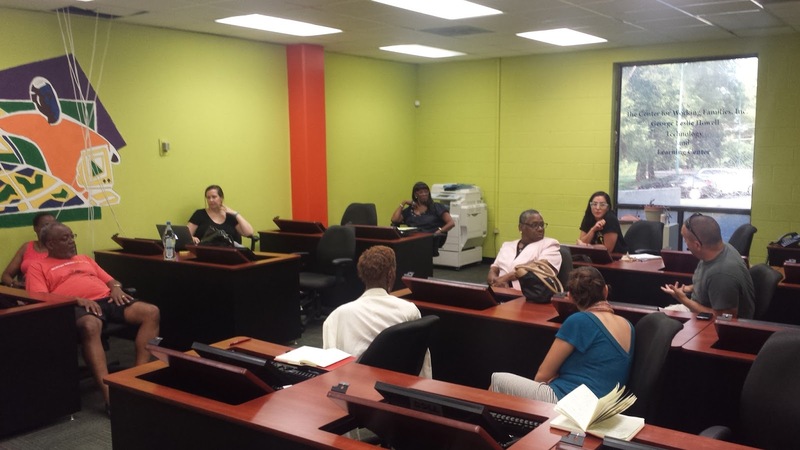 That work has been a launching point to meet with other tenant leaders in the Peoplestown area. 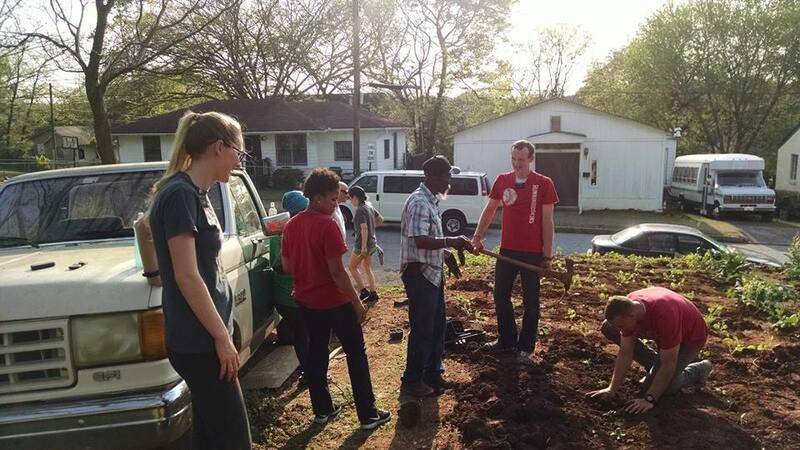 Responding to the lack of good food in the community we have been working with Pittsburgh(right next door to Peoplestown) resident Tommy Moore to help him raise funds to develop community gardens. 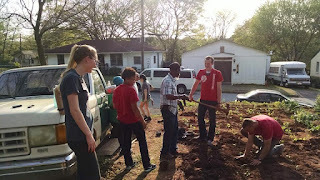 Tommy is a miracle worker in the garden and has used the resources to develop multiple gardens sights, teach young people to grow food, and feed the neighborhood free of charge. We're so excited to to able to work with Tommy are currently working with him to break ground on a new garden this month. We have organized to big trash clean up days with college students focusing on the peoples town community. 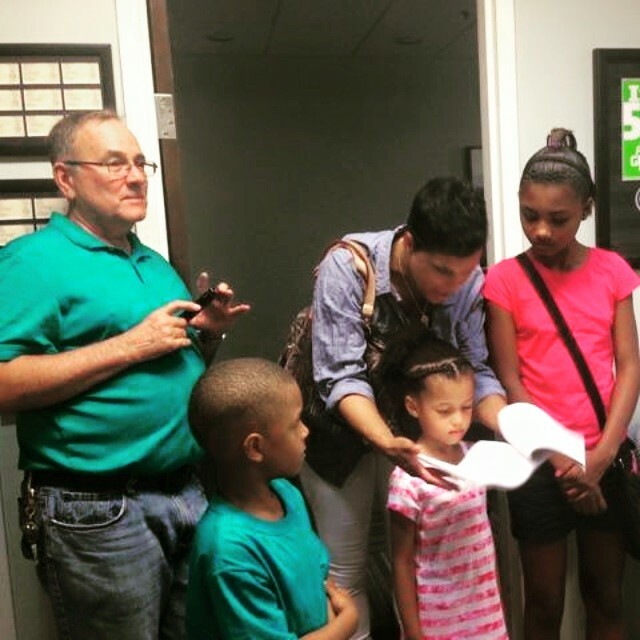 We have joined and put energy into building and strengthening the Turner Field Benefits Coalition, with is a coalition of over 40 groups, mostly based in the neighborhoods surrounding Turner Field. At this point the coalition is fighting to insure that those that live in the neighborhood will have a real voice and an impact on what happens to the land the Braves used after they leave. Sadly up to this point it seems as if community members have not been given space at the table. It's a cruel irony that many of the things the neighbor hood wants did used to exist. Fifty years ago Peoples town, Summerhill, Mechanicsville, Pittsburgh, Adair Park were considered more a part of downtown than Midtown is today. You had everything you needed to survive in the community. From grocery stores to theaters, to doctors offices, and local business. The highway came through, the Olympic stadium, Turner Field, all came with the promise of positive development for the community, all ended up hurting more than helping. We are excited to be a part of a coalition aimed at challenging the model of development that displaces long term residents and treats the neighborhood like a giant ATM.